Cree has announced the CXA1310, CXA1850, and CXA2590 chip-on-board (COB) LEDs with light-emitting surface (LES) diameters of 6, 12, and 19 mm. respectively. The products are part of Crees COB offering that the company terms high density and are designed to maximize the candela (cd) per dollar for directional applications, as opposed to the standard-density products that are focused on maximum lumens per dollar. 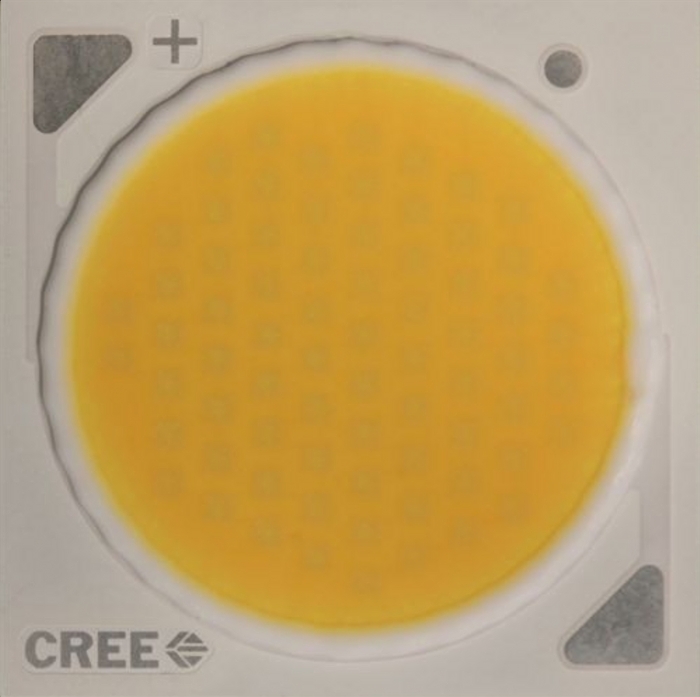 Cree first announced the high-density concept back in September of 2013 with the 9-mm CXA1520 that offered double the output of the prior Cree LEDs in the same size. The new products extend lumen output to beyond 13,500 lm at 5000K CCT and to 11,500 lm at 3000K CCT. The 5-mm CXA1310, meanwhile, delivers flux in the 2000-lm range. Cree says that the performance is industry best relative to the LES sizes, and a smaller LES enables simpler, lower-cost control of the beam with smaller optical elements such as reflectors. The LED chips are available across the range of 2700K to 6500K CCT. Cree offers 80-CRI portfolios across the board, 70-CRI products at the cool end of the spectrum, and 95-CRI products at the warm end of the spectrum. With the new product launch, Cree also stressed a new way to consider LED performance, and the match of LEDs to an application, called optical control factor (OCF). Essentially the metric comes down to performance divided by surface area of the emitter, whether the LED or LEDs under consideration are in COB array or discrete form. Paul Scheidt, product marketing manager for LED chips at Cree, discussed applications and LEDs relative to OCF. He said applications such as linear troffers can benefit from mid-power LEDs that have low OCF that is a match for the broad beam spread, diffuse light requirements of the application. He said Crees mainstream CXA family is also a good match to other applications with diffuse light requirements such as BR lamps and downlights. The high-density COB LEDs are targeted at high OCF applications including directional lighting ranging from PAR/MR LED replacement lamps to tracklights to even low- and high-bay fixtures that need to focus the beam. Primarily, the LED chips target applications that require maximum center beam candle power and enable system performance legacy sources cant serve. "Never before have we been able to draw such a large amount of light in such a small package, which can help us improve our lighting designs and deliver a number of applications that we previously could not, " said Mike Wang, vice president of lighting engineering at Edison Price Lighting. "The beauty of these new high-density LED arrays from Cree is that they are helping us bring products to the market that currently dont exist." To illustrate the advantages of the new products, Cree has assembled some prototype light engines to which it compared existing lighting fixtures and lamps based on legacy sources. For example, Cree has demonstrated a CXA1310-based engine that delivers 31,000-cd CBCP and a 9° beam at 15.4W. Scheidt compared that product to a typical track fixture that uses a 44W Philips PAR20 ceramic metal-halide (CMH lamp) that delivers 13,220-cd CBCP and a 10° beam. In fairness, the Philips CMH lamp is 86 CRI and the Cree prototype is 82 CRI. But the performance advantage of the LED option is clear. Scheidt said that a quality track fixture sells for $200 in high volume and the lamp for around $20 with those prices doubled if bought in individual quantity. He said that the bill of materials for the LED light engine was in the $34 range in high volume including LED, driver, heat sink, and optic. Of course, the track fixture includes a ballast and that component is equivalent to the driver in the LED light engine. But the point is that a track lighting can easily contain the cost of the LED light engine and deliver superior performance. The comparison ignores the fact that the LED light engine would still need to be accommodated in a fixture, but still shows the value proposition of the higher-performing and more-efficient LEDs. Scheidt also stressed that the LED implementation delivers performance that is simply unavailable in legacy sources. He said that the very best PAR20 CMH lamps top out at 2000-cd CBCP. Yet the LED prototype offers more than 50% additional performance even though the actual lumen output of the CMH lamp is greater. Another prototype LED engine in Crees portfolio is based on the 21-mm CXA1850. Scheidt compared a 3000K, 55,620-cd CBCP, 38W LED product with a typical track fixture equipped with a Philips 74W, 50,559-cd CBCP CMH lamp. The Cree prototype used an off-the-shelf Nata optic that Cree had on hand to deliver a 15° beam whereas the Philips lamp delivered a tighter 10° beam. At first glance it would appear that the CMH product is higher performing given the narrower beam. But Scheidt pointed out that the LED engine would have even a higher CBCP spec if equipped with a reflector that narrows the beam. The largest CXA2590 LED, meanwhile, can deliver the equivalent CBCP of a 150W CMH source at almost half the power. "The high-density LED arrays from Cree are extremely impressive," said Kenny Eidsvold, president of Intense Lighting. "We are looking forward to using these products in applications requiring very high center beam candle power that previously could not be achieved with LED-based solutions."